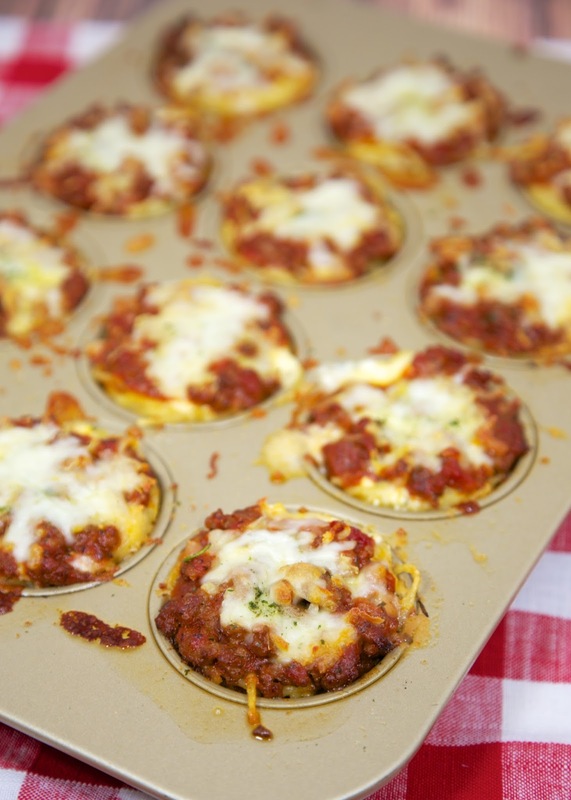 Mini Spaghetti Pies Recipe - individual spaghetti pies baked in a muffin tin. Can freeze leftovers for a quick meal later. Since they are small, they reheat in a flash! Our new favorite way to eat spaghetti! These mini spaghetti pies are so cute and so much fun to eat. It was a great change to our usual spaghetti night. I loved the individual pies. We ate these for dinner, and I ate leftover for lunch the next few days. They tasted great reheated. 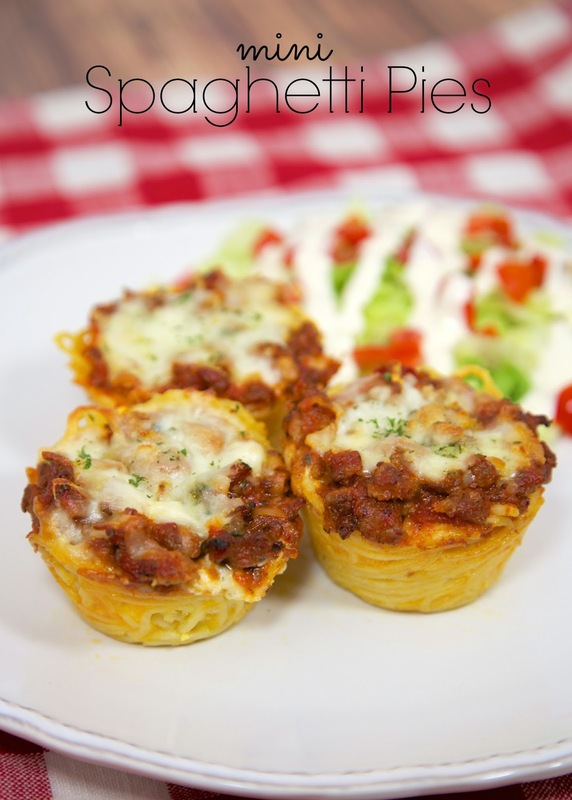 These mini spaghetti pies are also great for a quick freezer meal. Since they are small, they reheat in a flash! It looks like a long process to make these, but I had everything going at once and it didn't take long at all. Boil the noodles and cook the sausage at the same time. Mix up the cheese filling while all that is going on and you are ready to assemble the pies when the pasta is done cooking. Preheat oven to 350ºF. Lightly spray a 12-cup muffin pan with cooking spray and set aside. Cook spaghetti according to package directions. Drain and put in bowl. Mix together spaghetti and butter. Add whisked eggs and 1/2 cup parmesan cheese. Toss to coat, making sure all pasta is coated. Divide spaghetti into 12 muffin cups. Press down into cup. While pasta is cooking, brown sausage in skillet. Drain fat. Stir in spaghetti sauce and set aside. Mix together cottage cheese, 1/4 cup parmesan cheese and dried parsley. Divide cheese mixture over spaghetti. Top each spaghetti muffin with sauce (you may have some leftover). Top with shredded mozzarella cheese. Bake 30 minutes, until cheese is lightly brown. Serve with any leftover sauce. I love your recipes - read them every day!! I often save the recipes to a program I have which captures the recipe and the photo. It would be so nice if your photos weren't so large as they take up a lot of space. I have been waiting for this post!! Can't wait to try these!! So cute and yummy looking. how much spaghetti should be in each tin? These are the CUTEST, look delicious and I'm sure they disappear quickly! These were so good and so easy to pull together! My 2 year old got a kick out of my calling them spaghetti pies. This is going in my weeknight menu rotation for sure! Can I freeze these? I want to make some and freeze to give to my daughter for after she has her baby!